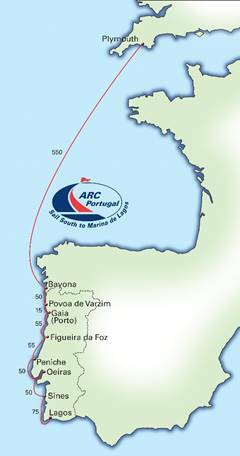 ARC Portugal Rally Fleet departs for warmer waters.... at last ! The twenty-strong fleet of yachts sailing with World Cruising Club's annual ARC Portugal rally set off from Falmouth yesterday (Sunday 11 June), having finally found a weather window for the trans-Biscay stage of the rally. The international group which includes cruisers from Norway, Germany and America alongside British sailors, are headed to Bayona in Northern Spain, just over 550nm direct, which will take most boats 4-5 days. Initially scheduled for a departure on Sunday 4 June, a succession of strong Atlantic lows barrelling into the Western Approaches have kept the boats securely docked in port waiting on a better forecast. In place of the anticipated trans-Biscay leg, the first sail was from host port Mayflower Marina in Plymouth to Falmouth, a short coastal hop before the first low came by. The crews have made the most of their time in Falmouth visiting local attractions and of course sampling the traditional pubs and restaurants that surround the Cornish harbour. Whilst in port, the rally team have been busy rescheduling events and docking for the second part of the rally, cruising south from Bayona along the coast of Portugal to Marina de Lagos, on the Algarve coast. Weather delays are expected for leg one of the rally, but such an extended delay is very unusual in the 21 year history of the rally. The three week adventure enables crews to explore the Portuguese coast on their way south. Stopovers on the route include Povoa de Varzim, Porto, Figueira da Foz, Peniche, Oeiras and Sines - each are enchanting port locations which offer opportunities to conveniently visit historical sights, enjoy regional wines and local cuisine and experience the warm hospitality of hosting yacht clubs and marinas. This year's crews are certainly in for an exciting mix of great sailing and great sightseeing in the weeks ahead. The annual rally has once again attracted a diverse fleet including a mixture of sailors who are new to longer passages, experienced double-handed crews and those who have sailed the Atlantic before. Many of those taking part are familiar faces to World Cruising Club rallies, including three boats that have previously sailed with ARC Portugal and are back for more! For others, this is the launch pad to a new live-aboard life in the Algarve or Mediterranean, and ten boats are set to continue their offshore adventures with ARC later this year. There is one catamaran, A'r môr dirion, a Broadblue Rapier crewed by Ian and Westa Hopkins, and nineteen monohulls in the 2017 fleet. The largest boat is Gregg Kelly's Oyster 575 WikiWiki, whilst Gary Clements' Southerly 110 Arcarius of Plymouth is the smallest at 10.62m (35ft). Even with a clear weather window for the crossing, boats will receive daily weather forecasts whilst at sea, helping their routing decisions. Positions are tracked via YB3 trackers from YB Tracking, allowing families and friends to follow the progress towards Spain via the rally website. World Cruising Club's crew connect service, OceanCrewLink.com also proved invaluable, as 8 boats needed to find last-minute crew to replace those unable to commit to the extra time away caused by the delay. First arrivals are expected into the Monte Real Clube de Yates in Bayona on Thursday 14 June, with all boats due in before the weekend.